The Aqua Blast Corp. was established in 1962 to provide you with skilled manufactured pressure washers. Today our pressure washers are still going strong. We have set our standards high with Versatility, Dependability, and Customer Satisfaction as being our goals. Our specialty is custom-built units, to fit each and every one of our customers specifications and needs. 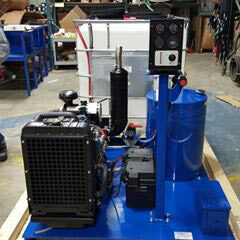 We offer a wide variety of hot or cold water, electric or gasoline, diesel or natural gas, portable or stationary, truck or trailer mounted pressure washers. We manufacture our pressure washers with 2 GPM to 650 GPM and 500 PSI to 20,000 PSI. Our units are built to be versatile with easy maintenance. We recognize how important service after the sale is in order to achieve our objective of a satisfied customer. Therefore, we stock a complete line of replacement parts and accessories in our warehouse for quick response on part orders. We have technicians available to assist customers with any kind of parts or service questions.